Glass tabletops and glass shelves offer unparalleled furniture protection and modern appeal for any home or business need. Using a glass tabletop on your dining or coffee table can help protect your furniture investment from water stains, physical damage and general wear and tear for years. Glass shelves for kitchen cabinets, entertainment centers and bookcases can allow you to remove bulky wooden shelves and replace them with contemporary and thin counterparts. Interested in updating or protecting new or existing furniture? Call us today! 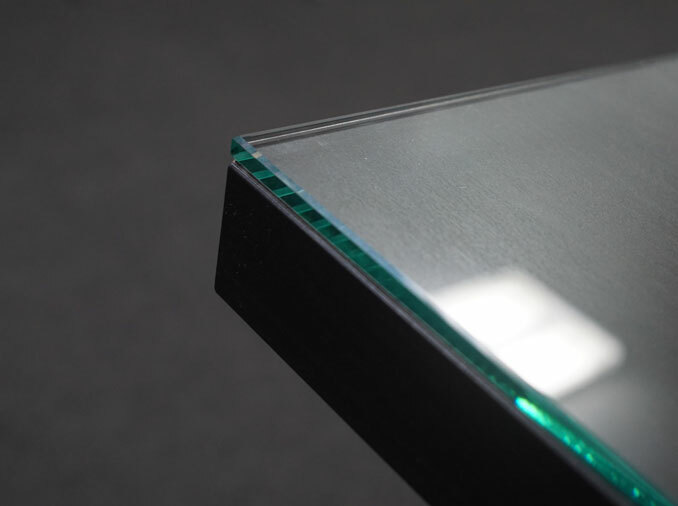 A glass tabletop protector with flat polished edge-work on an office desk. Whether it's a round glass diameter, a square piece of glass for a night stand, a rectangular piece of glass for a coffee table or a custom one-of-a-kind shape, glass is an inexpensive and highly effective way of protecting your furniture. Our trained technicians can show you glass samples, edgework differences and take patterns of almost any tabletop need. Call today to discuss your glass top needs. Glass shelving can easily and inexpensively replace wood shelves that comes standard in bookcases, kitchen cabinets and desks. Since all of our glass shelves are custom cut to your exact situation, we can place glass shelves almost anywhere. Click for more information. Examples of glass shelves with 1/4" Clear glass and 3/8" Clear glass. A heavy glass dining room table on a modern base. ⅜" to ½” heavy glass tabletops can allow you to have beautiful, almost freestanding glass tabletops with just a basic stand. If you have an existing tabletop that was damaged or just want to make a custom tabletop out of a special base, National Glass can get you taken care of.